She saw him approach the gates to the ranch out of the corner of her eye. Feeling a burst of excitement, Malon gathered her skirts and ran to greet the hero and her beloved Epona. "Welcome back, Fairy Boy!" As if prompted, Navi popped out of his hat, fluttering towards her to say hello. 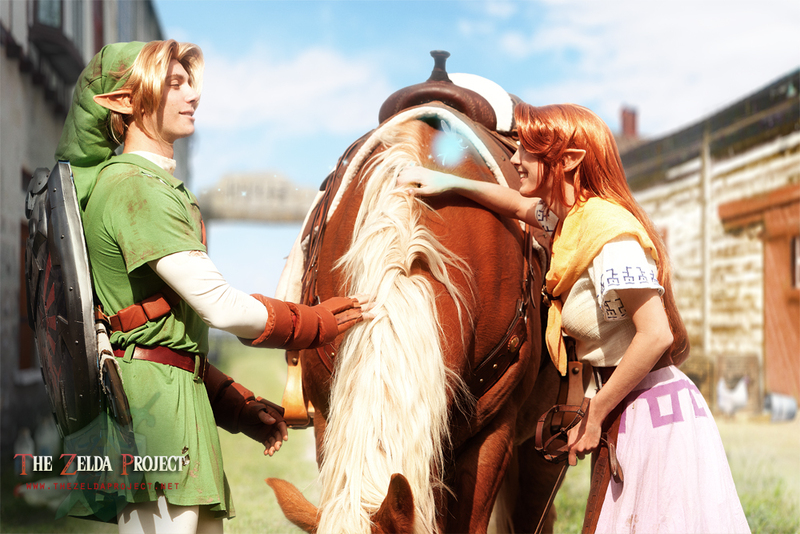 The Zelda Project is a Los Angeles, CA based group of friends who seek to bring to life the characters, settings, and overall feel of Ocarina of Time through photography and film. Our ultimate goal is to create the characters as they would appear in reality to the best of our abilities, placing them in beautiful sceneries true to their Hyrulean counterparts, and creating elaborate photosets, as well as a film short (coming soon! Stay tuned for our Kickstarter project!). The Malon costume is a classic remake of my original Malon costume. The skirt, blouse, and scarf are all 100% linen of varying weaves and thicknesses. The costume has been distressed to show wear and tear, assuming that Malon would get dirty if she was working on the ranch all day! The background is a beautiful digital matte painting by Mickael Forrett. I always wanted a photo of Malon interacting with Navi. I thought it would be cute, so I just couldn't resist the idea of this one. This cosplay photo was a huge combined group effort that was a labor of love by friends and fans of the Legend of Zelda series. Combining all aspects of art from photography to matte painting, we wanted to bring the Legend of Zelda to life as best we could in a final presentation. So far this has been incredibly rewarding, and we hope that those of you who view our work are brought a little bit more into the world of Hyrule through our art. A special thanks to everyone who has helped us get this far! Without all of your support and kindness we wouldn't have been able to make this happen. We only hope that with what we produce, a smile is put on your face!